I was approached by NIVEA and asked to participate in a Daily Indulgence Challenge to pamper myself and my skin. Since the summer in Utah is dry dry DRY I said Sure! My skin is not all that bad, it’s not super sensitive like my kids’. But I do have those little bumps on the backs of my arms and I like to have a good exfoliant to help tame them. I was sent this awesome package valued at $130 of NIVEA Indulgence items. It included a cashmere soft robe, NIVEA Touch of Smoothness Moisturizing Body Wash and NIVEA Touch of Renewal Exfoliant, a scented candle, and a $50 gift card to Bed Bath & Beyond. Awesome! I got to work setting up my bathroom so I could create a spa-like atmosphere so as to truly pamper myself. 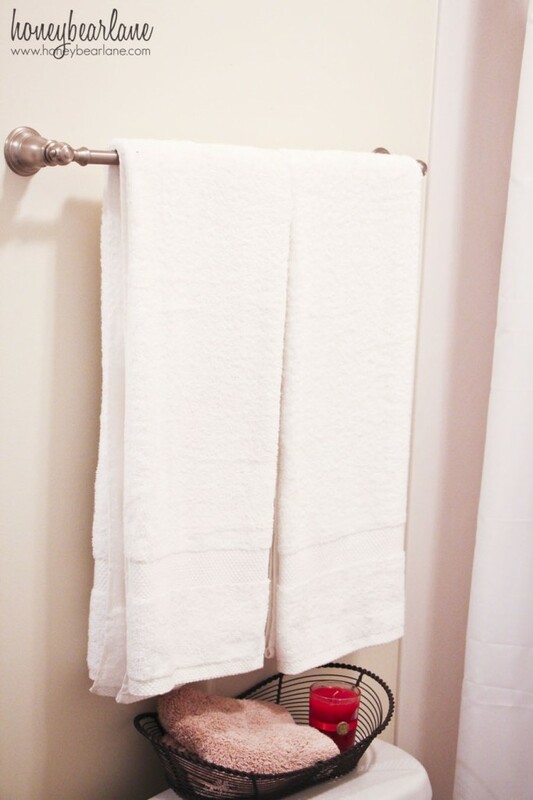 I went shopping at Bed Bath and Beyond and got some super plush bathroom rugs and new white towels. Some people are really afraid of white but I LOVE having white in the bathroom. It is so serene and calming and clean looking. Plus any product that may contain some chemical that could bleach my towels won’t be affected by white towels. 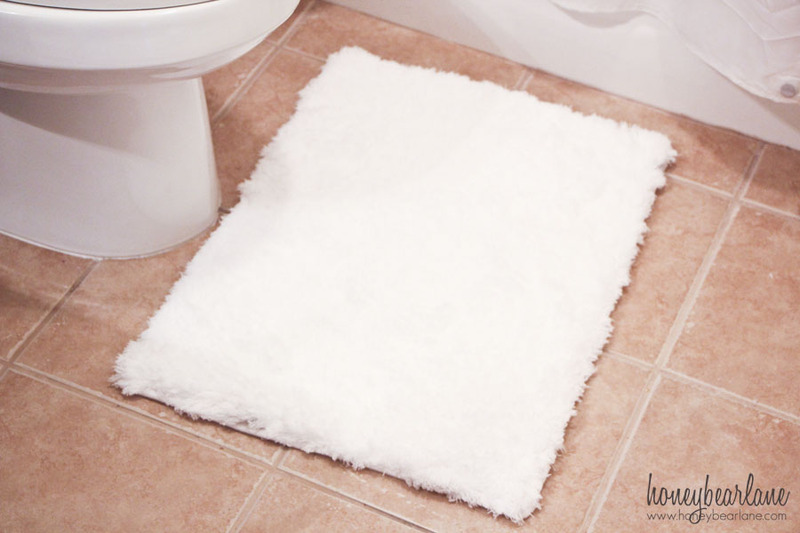 I especially love the rug by the toilet since it has memory foam and microfiber threads and MAN it is so soft. My husband appreciates it too since he has an injured foot. And PS–that ROBE! It is so plush and soft, I could literally hang out in it all day. After my bathroom was all set up and serene, I started to use the NIVEA products they sent me. I really like them, especially the Touch of Renewal exfoliant. It has just the right amount of grit in there to get the dead skin off and leave your skin so smooth and soft. It also has some amazing lotion-ey ingredients so you don’t even feel like you’re using soap–it doesn’t strip your skin of any moisture. And it has that great clean smell. After a couple weeks of using these products, I feel like my skin really is softer and definitely more pampered than it was before. So do you want to take the NIVEA Daily Indulgence Challenge? One of you will have the opportunity to win all these products I got to try out. Enter the Rafflecopter below and good luck! I would love to treat my dry skin to these products as it needs some tender loving care! 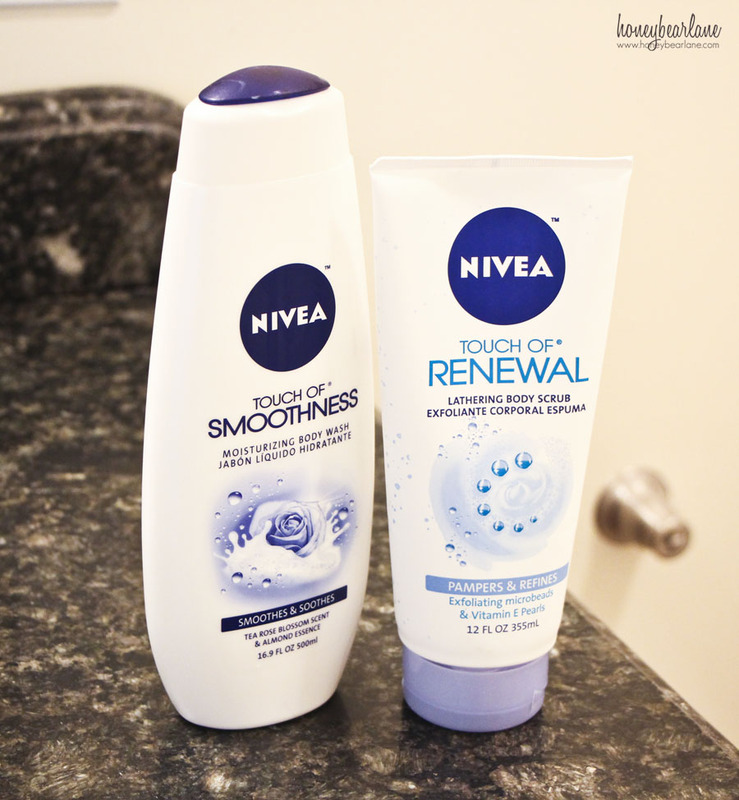 I love Nivea lotion…..and would love to try these products!! Thanks for the chance!! Nivea is the best! I work two jobs, cant afford to take a real vacation, so this Nivea would be an added bonus to my mini staycation spa regimen! Fabulous review and Giveaway….Thank You!!! with a house full of boys, I need this to treat myself!! I have the driest skin, this would be so nice! I would like to pamper myself with this kit! Hi! I would love to win and pamper myself. I am really dried out like an alligator!l lol At my age I need all the help I can get!!! Thank you for the chance to win!! Thanks Heidi I’m already relaxing! I would love to try this on vacation to completely relax! I need a mom timeout! This would be perfect. I need to win because it would help me relax after a long day at work. I would like to win b/c my job is very stressful and this would help me do some much needed relaxing. I would love to give this to my sister who has 4 kids and would love a break! I have had a lot of stress lately and need to destress. I would love to be able to pamper myself. I have been helping my mother move and haven’t had any me time. I want to pamper myself so I would love to win. Oh things have been so hectic…I really would love some me time…and what a better way than with some new Nivea products to indulge! 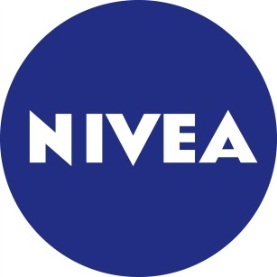 I need to win because I love, love, love nivea!